You never know what is going to spark interest in a non-gardener. Men, especially seem to be drawn toward large plants, like bananas, and are captivated even more if they produce flowers and fruit. Add in a neighborhood rivalry and let the growing begin. In our Zone 8 garden last winter, we had very little in the way of freezes. Then this summer the heavy rains came. Our banana trees are rewarding us with a flower stalk and fruit. We gifted one of our neighbors a few banana plants in past years and he was the first with a flower stalk. Who knew rivalries would extend from the first tomato to the first banana? Banana trees need two growing seasons in order to set fruit. If you want your banana trees to bear, you have to move them out of the garden if your ground freezes in winter. They can stay outdoors in a protected spot in zones 7 and up but if you want fruit, even zones 7 and 8 growers should dig them and hold them indoors through the winter, somewhere that the temperature does not get below 40 degrees. Even though they are easy to dig with small root balls compared to their size, I don’t bother digging them anymore. I do remove the pups, the new shoots at their base, and share them with friends. You can leave so-called hardy bananas, grown for their ornamental foliage only, in the ground in zones 7-8 if they are heavily mulched. Add at least 6-8 inches of fallen leaves to the base of the plants. Leave the trunks standing; do not cut them back in the fall. Bend down the leaves around the trunk/stem for further insulation. As insurance against a killing freeze, always dig and store some of the offsets. Since the plants quit growing at about 50-55 degrees, you can dig them any time in the fall, before the first frost. No need to pot them up, just wash the dirt off the roots, fold the leaves down around the trunk, and wrap the whole thing in newspapers. Store where the temperature stays above freezing; between 40 and 50 degrees is ideal. You can stand them in a corner or lay them on the floor. Next spring, when the weather has settled, take off the papers, cut off the leaves, and cut the trunk back to firm flesh. If it feels firm all long the trunk, then there is no need to cut it back. 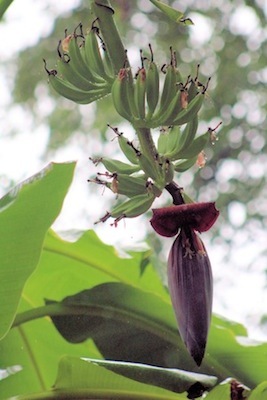 Even though we call them trees, bananas don't grow on trees but on herbaceous plants. Their tall stems enclose a shoot that grows up through the middle and opens into huge leaves at the top. Set your plants out after the frost-free date in your area. Check with your County Extension Service or local Master Gardener Association if you don’t know what it is. 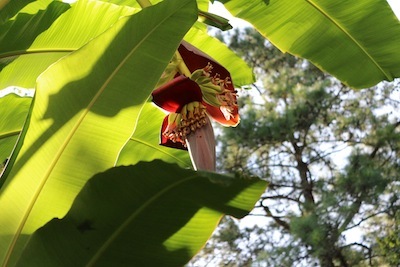 You should plant bananas in a protected spot in order to keep their huge leaves from becoming tattered by the wind. They are heavy feeders and users of water. Add a little lime and 10-10-10 fertilizer in the beds before planting or broadcast at their base after removing the heavy winter mulch. If the rains do not come, then plan to water them three times a week and feed with a water-soluble fertilizer every 6 weeks to 2 months. A fertilizer with nitrogen and high potassium content is ideal but keep the phosphorous levels low. It might be 2 months before a flower stalk appears. The flower buds look as though they are dangling on bungee cords. There is a succession of color up the stem. Maroon-red wings lift up to expose the yellow and red flowers underneath, one ring at a time. The green fruit then enlarges and develops. Another ring of flowers opens and starts the process all over again. Cut the fruit stalks when the bananas start to yellow or if the nights are going to dip below 50 degrees. You can bring them indoors and leave them to ripen on a kitchen counter. In the short summer areas of the country, it would be best to move your banana trees indoors and out in a container so that they have enough time to set fruit, if fruit is what you want. Just make sure you have young plants coming along to replace the mother. After fruiting, you can cut down the banana plants and add them to the compost pile. They die after they raise their fruit. If you cut the trunks off at ground level, the old roots might sprout new plants, giving you more to grow and share. Who knows, maybe you will start a neighborhood rivalry and shape a gardener. Stokes Tropicals offers many different kinds of bananas along with good growing information and Plant Delights Nursery has increased their banana offerings.